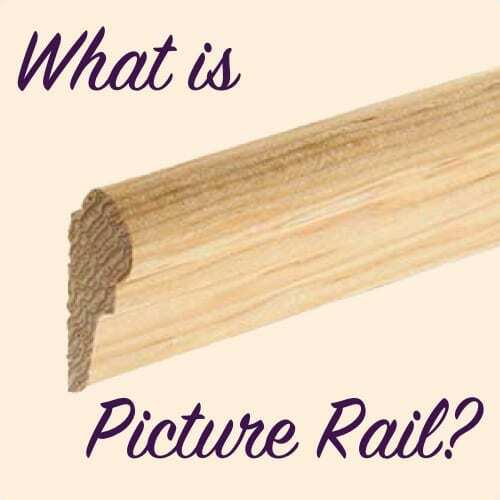 What is picture rail? It’s common in older homes built before WWII and more common the older the home is. A lot folks don’t understand this simple piece of stock molding that is sometimes mistaken for crown molding or other things, but picture rail has a very specific design and function. Maybe your old house has a picture rail and you want to know how to use it properly. Maybe it doesn’t and you are thinking about adding one for some style and pop to your walls. In this post, I’ll tell you what it is and what it isn’t, how to recognize it, and more importantly how to use it. Picture rail is a small molding usually about 1 1/2″ to 2″ wide installed horizontally on walls within the top couple feet of the wall. Sometimes it is installed right up against the ceiling, only being spaced down from the ceiling about 1/2″, which can confuse people into thinking it’s a very small form of crown molding. But crown it is not. Picture rail is not just a decorative molding, it actually serves a very specific function. It is designed with a small lip on the top of the molding in order to accommodate a picture rail hook. The picture rail hook is by far the best way to hang things on a wall without causing any plaster damage. When installed properly, by being nailed into the wood studs with larger finish nails, picture rail can support heavy loads being hung on walls like large mirrors or paintings that normally require drilling holes in the plaster and installing anchors. Picture rail or crown molding? While it might work for mirrors, I don’t think I’d try hanging a flat screen TV, so, don’t blame me if you try that one! If you do need to install other items on your plaster walls but don’t plan to use picture rail, here is a good post to guide you to success: How To: Hang Things on Plaster Walls. One of the great things about picture rail is that it makes the relocation both in height and position on the wall amazingly simple. To move something left or right on the wall you just slide the hook to wherever you want it positioned. If you want something to be higher or lower, you can simply shorten or lengthen the wire on the back of you picture. No more trying to find a stud or drilling another hole. There’s a right way and a wrong way to use anything and picture rail is no different. There are two big mistakes I see when using picture rail and both can spell major disaster. Don’t make these mistakes unless you like the sound of things breaking. I’ve seen people use picture rail in a way that I can only assume they learned from seeing pictures of it online. It’s hard to notice the picture rail hook, but this is the linch pin for a successful installation. If you try to hang pictures by putting a nail into the picture rail and then hanging the wire on that nail, you’re in trouble. 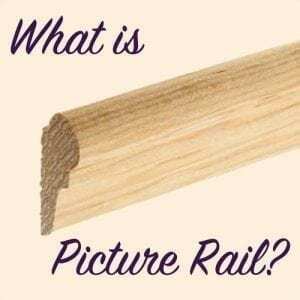 Picture rail is a small piece of molding and nailing through the face of it can easily split the wood enough that your picture may eventually come crashing down when the molding breaks. Solution: Always use picture rail hooks and never use nails. Plate rail is a whole other type of molding designed to hold and display plates along a wall. Plate rail is not a specific design of molding, but rather an application of trim to create a very wide shelf that can display things. If you try to display plates or other collectables by setting them on top of your picture rail, you are one bump away from shattered china. Picture rail is far too narrow to have anything displayed on top of it with any sense of security. Solution: Install a wider molding to use as a display or plate rail. Picture Rail in New Houses? While picture rail is typically found in old houses with plaster walls, it can be a fun way to dress up plain drywall and give it a fancy old-world feel for very little money. If you plan to install new picture rail, whether you have a new house or old house, make sure you install it with strong nails. I recommend installing by nailing to every stud with a 2 1/2″ 15 ga. nail if you plan to hang anything of significance on your picture rail. 18 ga. brad nails, no matter how long, just won’t have the holding power you need for this hard working molding. You may be able to find some picture rail at your local mill shop, but if not, HouseOfAntiqueHardware.com carries a few designs of picture rail and also several different styles of picture rail hooks. Thanks so much for this article (and the comments)! I had no idea about the picture rails in my 1945 house, until I found this blog post. Yesterday I talked to one of the big box store reps who agreed that the gap behind my apparent crown molding should be sealed with foam backer rod, then to use latex caulk over that. When I got up on the ladder, it just seemed crazy and that the gap was left for a reason. However, the paint and wall plaster has cracked in some areas behind the gap because the house has settled. Should I use latex caulk to smooth over those cracks or use a plaster compound? Most of the house has plaster walls and ceilings and I’m using your blog to help me repair those hairline cracks as well. Thanks ahead for any advice. HI, I have a mid-century modern home and need to change to picture moulding. I have plaster walls, a stone and mortar fireplace wall and radiant heat in the ceiling. Are there modern designed picture moldings and can they be glued to a stone wall? I don’t want to screw anything to the ceiling ’cause of the heating system and the only way I can think of to attach to the stone wall is with an adhesive. I’ve looked @ some European systems, but they seem a little too complex. Any recommendations? I’m considering installing two picture rails in my Victorian house. I don’t want traditional wooden moldings, but instead, some sort of dark or black, thin metal pole. I want the rails to be inconspicuous against the dark walls, as the room has quite a lot going on. I don’t want to make the rails into a feature, but do want to practically hang our art and photos, without hacking into the fragile plaster. I have no idea what to use for the rails. I was considering curtain poles, but wouldn’t be sure about the types of fixing I’d need to make the rail adequately strong. Any help or ideas would be much appreciated! Is picture rail typically installed in bedrooms? I have a 1923 CA bungalow and all rooms except the bathroom, kitchen and what I assume is supposed to be the master bedroom (bedroom with small attached sunroom) have picture rails. I am trying to decide if to install in bedroom or if there is a reason not to add. Did you ever get a response to your question? We had a similar question about our 1924 traditional home. Hi. Found this blog because I am trying to find out where to buy picture rail moulding for a garage apt. But I can tell you that our 1920s home has original picture rail in every room except the bathrooms. And I really love not having to drill holes into any walls. Hope that is helpful. I hope you find something that works great to you! I happened to just tour the Riordan House in Flagstaff, AZ, which is a beautifully preserved Craftsman style “double mansion” built by two brothers. There was definitely picture railing in some of the bedrooms. In others, particularly the master, there was plate railing which displayed smaller framed photographs and such. The reason for having picture railing was to avoid damaging delicate plaster walls so the same consideration would have been true for bedrooms. I lived in a 1920 apartment building that had picture rail in the living room and bedroom, I’m sure both were original. I would guess that sometimes it is an additional detail only put in the ‘public facing’ rooms (to save some money). We bought a 1920’s home and would like to add picture rail since there is no crown molding at all and I like the look. One contractor advised against molding because it will highlight the uneven ceiling. 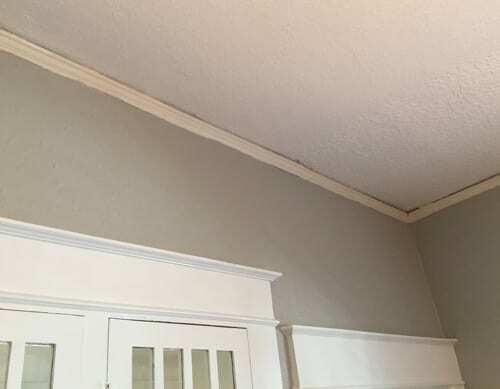 My neighbor has picture molding that does not touch the ceiling and painted the space between white to disguise their unevenness but I’m not sure if their ceiling is as bad as ours…would you recommend trying this? Sharon, my preference it to install the picture rail about 4-6″ down from the ceiling so that the unevenness will never show. It was often installed in this location for visual interest. I have picture rails throughout my 1925 bungalow and have hung most of my pictures on them and love them. But, in some areas a previous owner caulked the gap and that caulking has become as hard as plaster (in fact it may be plaster). Has anyone found a tool that would be useful for digging the caulking out? I don’t want to replace the rails as I believe they are all original. Dennis, there isn’t a particular tool for it but anything that can fit like a small chisel or 5in1 should work. I really appreciate this post! We have a picture rail (pointed out to us by a friend) and I’ve definitely made good use of it. I believe our walls are rock lath. I’m wondering how much weight do you think the picture rail can hold? i have a mirror I’d like to hang but it weighs at least 80 lbs if not more. What do you think? That’s a tough one. 80 lbs may be pushing it but I have never really heard of a specific weight limit. Does anyone have a picture of a picture hanging from this picture rail? My entire house has picture rail but wouldn’t wire be unsightly? Thanks for telling me about the railing hooks! I would have never known! The wire is visible, but whether it is unsightly is personal preference. Thanks, I searched on Pinterest and found some really cool ways to hang things. We just plugged holes and painted. I dreaded drilling more holes in this horsehair and plaster. Now, I understand how to use the pictur tail! Many thanks! The high ceiling at the top of the stairs is difficult for me to reach to decorate. I was thinking of installing a picture frame to make the wall below it more accessible to reach. whats your thoughts on it. Its a 1960’s house. Just discovered and loving your blog. We just bought a 1925 cottage that has an uneven gap between the ceiling and picture molding, in some places it touches and in others there is visible 1/4-1/2 inch space. The gap is from the house settling and new popcorn ceilings that lowered the original height. Would you keep the original picture molding or replace with new, larger crown molding to disguise the gaps? I’m not sure if this is one of the architectural details worth saving. If it looks unattractive where it is you can move it down within 8-12″ from the ceiling or cover it with larger crown. But don’t remove it. That way the next people can restore it if it doesn’t work with your design aesthetics. I had picture rail in my 1908 bungalow, installed right up to the ceiling. 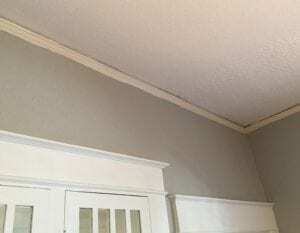 A previous owner had applied texture paint to the ceiling, and slopped it all over the picture rail. It looked horrible. I took the picture rail down, with the intention of stripping off the texture paint and reinstalling, but decided to go with a wider, true crown molding, instead. I’m glad I did, because I didn’t like the dark shadow cast between the old picture rail and the ceiling. Where do you buy it? I need to hang it for an art gallery against brick walls. Also, where do you buy the correct hooks for the configuration of the molding? The molding and hooks are available from stores on the links within this post. I saw picture rail in art galleries, museums, and older homes. After much searching, I found some locally, the clips were harder to find. As I collect art, I have installed it in this old house. I can rotate artwork on whim, so I LOVE picture rail. Ellen that is called “Rock lath” which was a precursor to drywall. Instead of using wood or metal lath this was a faster way after WWII to put up walls and then just do 1 or 2 coats of Plaster. Rock lath was a gypsum based plaster substrate. The standard size was 16″ X 48″. It came 6 sheets to the bundle which equaled 32 square feet. The same as a 4 X 8 sheet of drywall. It was 3/8″ thick and generally received 3/8″ of plaster. We used to get $1 a bundle to hang it and it took 96 nails per bundle. Lathers were very fast nailers. It was also sometimes fastened with different types of clips, screws, or staples. Picture rail could be attached to the lath like other beads and then plastered so only a small gap would be visible on the finished wall. Sounds like the walls in our 1947 fixer upper. We love the hard plaster vs dry wall. What is the best to fix when the plaster has pillowed cracked at most every seam? I’m so happy to have just found your site! I am trying to save my neighborhood in Kokomo and have already encouraged my neighbors and clients to come to your page as a resource. Thanks. look forward to reading your posts! A friend of mine is a landlord. He thought the picture rail was a gap that allowed cold air into the house, so he caulked it all! I was wondering if you could also do the compliment to this – how to select the picture rail hooks and (most importantly) how to attach picture rail cord to the frame of the picture we’re going to hang? Charles, I have a former picture framer working for me so I might be able to put that together for you. Any update to this particular question? Husband and I just bought our first home in Tacoma, WA, a 1925 bungalow, and your blog is quickly becoming our go-to resource! I have picture rails in my house and love them. It’s so easy to move pictures around without bashing holes in the plaster. When I moved in, there were picture rails upstairs, but none downstairs. A previous owner had added a piece of moulding in the dining room which wasn’t picture rail, but was hung where one would of been. They didn’t seem to understand what they were for as drywall screws in the plaster seems to be their preferred method. I did reinstall picture rails in all the rooms using a combination of salvaged mouldings and new. I must add that when I went to the local lumberyard (not a big box store) they did have new mouldings, but I did have to point them out on the moulding chart as they had no clue what I was talking about. I was able to find moulding hooks at the local Ace hardware, but they’re easy to find online. I’ve made it a point to inform other home owners if I notice the mouldings in their homes since it seems to be a foreign subject in this country.